"Middle Eastern Tagine & Herb Couscous"
A steaming plate of Couscous is always sure to evoke memories of holidays in Marrakesh or some other parts of North Africa . Close your eyes ... Picture the rolling hills of Morocco ... Feel the heat on your face and allow your nostrils to quiver with the pungent smells of the spices, drifting from the souk... Instantly an aromatic Tagine , rich with herbs, spices and fruits & Fluffy, light and moist Couscous Spring to mind . Despite the differences and even disagreements over what constitutes real Couscous . Is it a grain or is it pasta ? Well , it is commonly refered to as a grain !! Couscous refers both to the dry uncooked semolina pellets and to the ready to eat dish of light , fluffy , steamed grains. Since it's beginning as a Berber dish . Derived from the Arabic word " Kus Kus " , it is made from hard durum wheat / semolina / barley or even millet in some parts of the World . The Semolina Flour is sprinkled with salted water and rolled to form small pellets , a very labour intensive process , then dried in the sun . 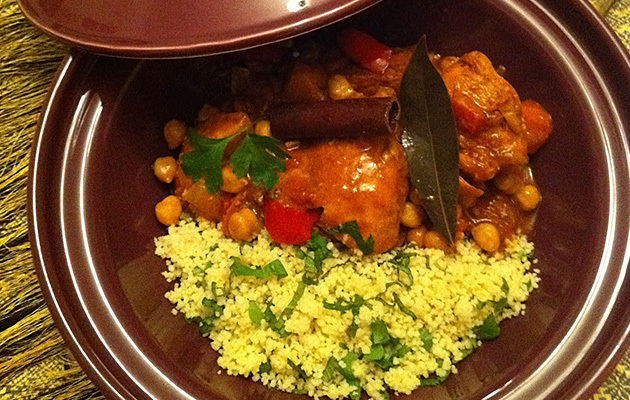 It is cooked by steaming , traditionally in a Couscousiere , a double boiler pot , the bottom holds a simmering stew while steaming the Couscous in the top steamer . It should be light and fluffy and is served with a rich and spicy vegetables / meat / fish stew . For the brave of palette , the hot pepper sauce " Harissa" as a side along with spicy "Merguez sausages " or tangy " Preserved lemons "
The Couscous we get today in Western Supermarkets has been pre-steamed , hence the grains swells within mins by pouring either boiling water or hot stock over it . The choice is yours . 2 tbsp of honey & a squeeze of lemon juice to taste . Ras Al Hanout is a mix of ground Coriander,Paprika,Turmeric,Cinnamon,Cumin,Ginger,Cayenne,Pimento,Cardamon,Cloves,Nutmeg,Anise seed, salt, white & black pepper . Heat the oil in a heavy based casserole dish and brown the meat in batches to colour all over, Transfer to a plate and set aside. Reduce the heat and sautee the onions , adding a little more oil if necessary , until it starts to soften , add the garlic & spices . Fry for a few mins until fragrant , add the tomatoe puree and chopped tomatoes . Return the lamb to the pot. Add the vegetables and bay leaves . Pour in enough stock to cover and simmer for 11/2 hrs , stirring occasionally . ( or put in the oven at 180 c for 2 hrs with a lid on , to prevent , the stew from drying out ). Stir in the chick peas , apricots , honey , and lemon juice to taste. Continue to simmer, uncovered for a further 30 mins . Can be prepared well in advance and reheated before serving . Vegetarian options : use Sweet potatoes & Butter beans / Aubergines, Courgettes , Red peppers / Butternut squash , Parsnips and Green beans . Tip the Couscous into a large bowl, pour over the hot stock . Cover with cling film tightly and leave for 10 -15 mins until all the liquid has been absorbed . Fluff up the Couscous with a fork to separate the grains & stir in the chopped herbs , lemon zest , lemon juice and olive oil . Check the seasoning and serve with the tagine .